Since 1992, following an accident in Preston, there has been heightened awareness about the dangers of memorials. In 1994, the Memorial Advisory Bureau produced “A Guide to Best Practice‟ for Burial Grounds and Memorials. In 1996, the Confederation of Burial Authorities (CBA) commissioned some research into the problem of dangerous memorials and the National Association of Memorial Masons (NAMM) issued a set of installation guidelines in their Recommended Code of Working Practice. Since that time the Institute of Cemetery and Crematorium Management (ICCM), have published management guidance in their publication the Management of Memorials, this was based on the research carried out by the CBA and supported by the Health and Safety Executive (HSE). Responsibility for the overall safety within a burial ground lies with the burial authority, in this case Prudhoe Town Council; these responsibilities are under the Health and Safety at Work Act 1974 and the Occupiers Liability Act 1957 to ensure that, as far as reasonably practicable, our sites are maintained in a safe condition. This includes ensuring that anyone who enters the site to carry out work, such as a memorial mason, carry out this work in a safe manner and in such a way that others using the site will not be put at risk. Whilst the responsibility for general safety lies with the burial authority there are specific responsibilities for memorials that lie with both the owner of the memorial and the memorial mason responsible for installing it. The owner of the memorial is responsible for maintaining the memorial in a good condition and should be properly informed, in writing, of their and other parties’ responsibilities. They should also be encouraged to insure the memorial, just as they do their household property. Memorial masons are legally liable for the work they carry out and should ensure that memorials are erected safely and in accordance with current standards available within the industry (such as quality specifications like the NAMM Code of Working Practice or similar). This responsibility is placed on masons in the Consumer Protection Act 1987, the Sale of Goods Act 1979 (amended 1994), the General Product Safety Regulations 2005 and the Directive on Liability for Defective Products (85/374/EEC). 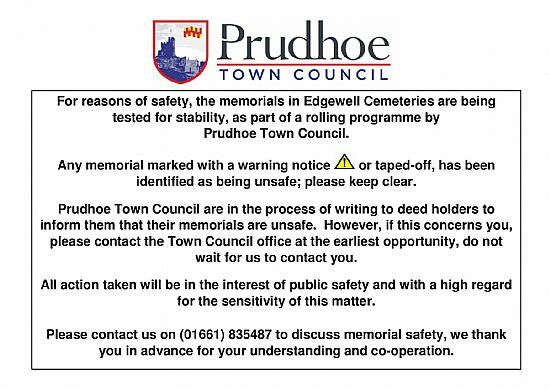 Prudhoe Town Council will only allow licensed memorials masons to carry out work in Edgewell Cemeteries and we have a robust system in place to ensure that proper practice is adhered to. Claims for poor workmanship can be made by the owner up to 6 years after the memorial has been installed. As the burial authority we are required to carry out regular inspections on memorials, at least once every 5 years. Where unsafe memorials have been identified through this inspection programme, we have a responsibility to ensure such memorials are not a danger to visitors and employees in the burial ground. Where possible, we will contact the owner and advise them of the problem and ask them to make the memorial permanently safe, usually by having it refixed. Obviously, if there is a clear defect with the way in which the memorial was installed then the owner may have some redress through the memorial mason who originally installed it, should it have been installed in the previous 6 years. If not, they will have to pay for the memorial to be installed to an approved standard. Where owners cannot be traced the burial authority has to make a decision on how to deal with the memorial.